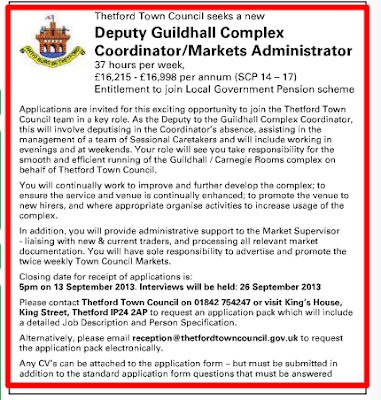 I'm really pleased that Thetford Town Council has created a new position of Deputy Guildhall Complex Co-ordinator / Markets Administrator. Some time ago I led on convincing fellow Councillors of the need for an initial full-time Guildhall Co-ordinator position as Chairman of the Councils Personnel Committee. Up to that point, all bookings / admin tasks were co-ordinated internally by office staff who had other responsibilities and all caretaking was done by the Councils existing maintenance staff. No single person had ultimate responsibility for the complex and service users often had a mixed experience when hiring the building. Maintenance and repairs were not picked up promptly and opportunities to develop new bookings and look for opportunities were often missed. This is despite the fact that the building costs Thetford taxpayers approx £100,000 per year to keep open - although thankfully this has continued to go down in recent years. 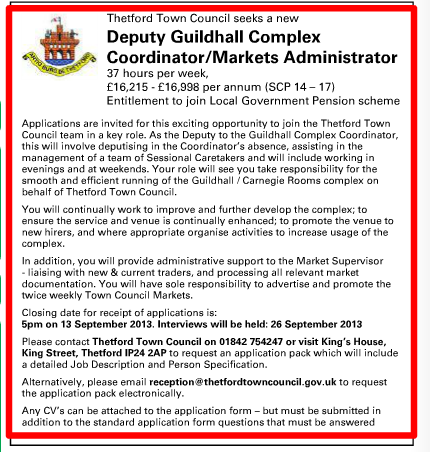 The initial full-time role has proved so successful that this new full-time deputy position has been created and will incorporate the role of looking after the towns market traders - again, a really important task that had been undertaken by an external agent in the past, but now - it will be provided by staff employed direct by the Council. A really significant step forward in the right direction for the Town Council and a good result for Thetford. If you want to apply for this new position, you have until 13th September 2013.